The ultimate in elegance! 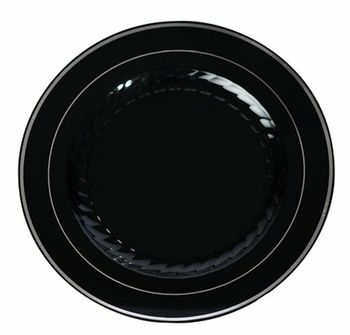 These striking black plates feature a beautiful Silver band for an added elegant touch. Silver Splendor 10 1/4" Black Dinner Plastic Plates w/ Silver Band 12ct. Silver Splendor 7" Black Salad Plastic Plates w/ Silver Band 15ct. Silver Splendor 6" Black Dessert / Cakes Plastic Plates w/ Silver Band 15ct. Silver Secrets Full Size Extra Heavy Plastic Forks 24ct. Silver Secrets Full Size Extra Heavy Plastic Spoons 24ct. Silver Secrets Full Size Extra Heavy Plastic Knives 24ct.